Canker sores (aphthous ulcers) are small shallow sores or ulcers that appear inside the lips, inside the cheeks, or on the gums. They begin as small, reddish swellings. Then they burst, and the rupture sores are covered with a white or yellow membrane. The edges of the sores are still red and look like a painful red halo. Without treatment, canker sores heal in two weeks or less. Canker sores occur inside the mouth, usually inside the lips, cheeks, or soft palate. They can also occur on or under the tongue and in the throat. Often, several canker sores appear at the same time and may be inclusters. Canker sores appear as a whitish, round area with a red border. The sores are painful and sensitive to touch. The average canker sore is about 0.25 inch (0.6 cm) in size, although they can occasionally belarger. Canker sores are not infectious. Anyone can get canker sores, but they are most common among teenagers and people in their twenties. Females are slightly more likely to get canker sores than males. Some people have one or two episodes a year; others have almost continual problems. Females are likely to have canker sores during their premenstrual period. Approximately 20 percent of the U.S. population is affected by recurring canker sores. That means as of 2004 some 56 million Americans suffer annually from these small but painful ulcers. Fortunately, certain safe, natural remedies are effective in treating canker sores. Canker sores are sometimes mistaken as cold sores (also known as fever blisters). Cold sores are caused by the herpes simplex virus. The sores caused by this disease, also known as oral herpes, can occur anywhere on the body. Most commonly, herpes infection occurs on the outside of lips and much less often inside the mouth. Cold sores are infectious. There is some evidence that canker sores are due in part to nutritional deficiencies and a lack of vitamin B 12 , folic acid , and iron. Gastrointestinal problems correlate with canker sores as well. Frequent recurrent canker sores may suggest a metabolic imbalance. The sores appear during times of stress or as a reaction to hormonal imbalances in women. Pregnancy causes remission. A tendency to get canker sores may be inherited. As of 2004 data suggest that aphthous ulcers are a form of autoimmune disease. Other proposed causes for canker sores are trauma from toothbrush and toothpick scrapes (trauma), hormones, and food allergies . The first symptom is a tingling or mildly painful itching sensation in the area where the sore will appear. After one to several days, a small red swelling appears. The sore is round and is a whitish color with a grayish colored center. Usually, there is a red ring of inflammation surrounding the sore. The main symptom is pain . Canker sores can be very painful, especially if they are touched repeatedly by the tongue or silverware. Infants and children may have difficulty sleeping because of the pain. The doctor should be called for pain relief remedies or medication to help the child through this period. The doctor should be called if the child runs a fever, refuses to eat or drink, and if the child shows signs of dehydration . Canker sores are diagnosed by observation of the blister, which generally appears in the mouth or throat. Canker sores are bacterial infections and not contagious. Recurrent canker sores may indicate a metabolic imbalance, dietary deficiency, stress, and a lack of rest. Children who have frequent canker sores may benefit from dietary supplements of B-complex vitamin or may undergo blood and allergy tests to see if some other underlying cause can be identified. 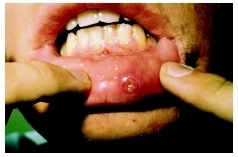 Apthous ulcer, or canker sore, on the inside of a patient's bottom lip. may relieve the pain. The use of corticosteroid ointments sometimes speeds healing. If an ointment is used to treat a canker sore, the parent should first dry the sore. Next, a small amount of medicine should be put on a cotton swab and applied to the sore. The child should not have anything to drink or eat for 30 minutes to keep the medicine from washing away. Parents can also try preparations of tea tree oil, goldenseal, propolis, licorice, myrrh, and lysine, products with healing nutrients that are backed by research. There are several treatments for reducing the pain and duration of the sores. The drugs frequently recommended are anti-inflammatory steroid mouthwashes, analgesics , and numbing ointments containing benzocaine. The following treatments may be effective in relieving symptoms or shortening the duration of canker sores in their children. Alternative therapies for canker sores are meant to heal existing sores and prevent their recurrence. Several herbal remedies, including calendula ( Calendula officinalis ), myrrh ( Commiphora molmol ), and goldenseal ( Hydrastis canadensis ), may be helpful in treating existing sores. Compresses soaked in teas made from these herbs are applied directly to the sores. The tannic acid in a tea bag can also help dry up the sores when the wet tea bag is used as a compress. Taking dandelion ( Taraxacum officinale ) tea or capsules may help heal sores and prevent future outbreaks. Home remedies and herbal preparations may not be readily available as over-the-counter in forms suitable for pediatric patients. Since canker sores are often brought on by stress, stress-relieving techniques such as cuddling and rocking babies until they fall asleep may help relieve the stress associated with the severity of pain. There is no cure for canker sores, and they occur more often with age. Treatments are to relieve symptoms or shorten the duration of the sore. If observation suggests a secondary infection, topical application of tetracycline to the lesion, three or four times daily, shortens healing to two to four days. Left untreated, canker sores can last as long as two weeks. Sores that persist for a longer time should be checked by a doctor. Children should avoid trauma, such as biting the inside of their mouth and tongue, or vigorous tooth brushing. Injury to the mucous membranes of the mouth and gums leaves places where bacteria can grow. This may make canker sores worse. To decrease the incidence canker sores, parents may consider changing to a toothpaste free of sodium laurylsulfate. Eating certain foods can be painful to a child with canker sores. Parents should remove spicy foods and citrus fruit from the child's diet. These foods may aggravate the sores and cause unnecessary pain. Parents should encourage their children to eat yogurt with active lactobacillus cultures because it may prevent outbreaks. Parents are mainly concerned with the comfort of their babies and small children. They must also pay attention to the nutritional intake of infants and small children who may refuse to eat because of the pain from canker sores. Over-the-counter treatments —Medications that can be purchased without a prescription. Sore —A wound, lesion, or ulcer on the skin. Parker, Philip M., et al. Canker Sores: A Medical Dictionary, Bibliography, and Annotated Research Guide to Internet References. Boulder, CO: netLibrary, 2003. "Canker Sores." MedlinePlus , January 13, 2003. Available online at http://www.nlm.nih.gov/medlineplus/ency/article/000998.htm (accessed December 14, 2004). does canker sores are cancerous?? ?